Pertussis, commonly known as whooping cough is caused by the pertussis bacteria which infects the windpipe leading to a violent and persistent cough. The bacterium infects the lungs leading to an inflammation within the lungs and airways, hence the cough. The name whooping cough is derived from the sound of the cough. You should know the signs of whooping cough in babies so that proper intervention can be taken. The symptoms of the first stage are similar to those experienced with a cold and these will last for about 2 weeks. The symptoms vary from a runny nose, sneezing, mild coughing, mild fever and watery eyes. The infected person is quite contagious at this stage. This stage lasts between 2 and 4 weeks, sometimes even longer. In this stage, serious symptoms begin to occur as the cold symptoms quickly fade, bringing in more serious symptoms such as dry, violent coughing. This cough may be accompanied by a temporary breathing problem and it occurs a lot of times a day – up to 30 times. When the patient tries to inhale quickly through the narrowed airways, they may create a whooping sound. In babies, the coughing spells may be triggered by the slightest stimulation such as feeding, stretching, sudden light or even sound. Symptoms such as flushed cheeks, bulging, watery eyes or a bluish complexion may occur. The latter is due to insufficient oxygen. The baby may stick out their tongue and push forward the chest or even wave her legs and arms in distress. While it may be a frightening scene, babies normally get better in between the coughing spells, but they are definitely exhausted from the coughing. 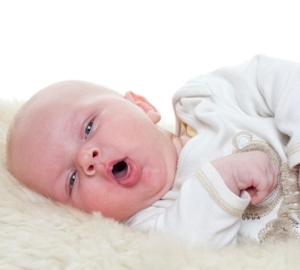 Sleep apnea also may occur and this disease could lead to hospitalization, especially if the baby is young. The final stage is luckily a recovery period and the symptoms tend to decrease at this stage. While the coughing is still evident, it’s less violent and frequent. However, it still could flare up if the baby develops a respiratory illness or a cold. The last stage may last a few weeks or even months and it is usually longer in patients who did not take the pertussis vaccine. Pneumonia and exertion relation injuries such as hernia can occur as a result of whooping cough and these risks are higher for children below 4 months. In children the major risks associated with whopping cough are convulsions, brain damage and death. It’s important to seek medical attention when you suspect that your young one has whooping cough. If your child has any of the above whopping cough symptoms, you need to seek medical treatment. The doctor will first have to make a diagnosis and a thorough medical examination will be taken along with blood tests, a chest x-ray and medical history. Some of the tests that are taken include extracting throat and mucus samples which are examined and cultured for the whooping cough bacteria. If the bacterium is confirmed, the doctor will put the child on antibiotics and these should be for 2 weeks. Antibiotics. Many medical experts believe that antibiotics help in reducing the progression and duration of the infection especially when taken before the coughing spells in stage 1. That said, the antibiotics still work even when administered at a later stage because they prevent the spread of the virus infection. You can also ask the doctor to issue vaccine boosters or preventive antibiotics for family members. Hospitalization. In some cases, the child will have to be hospitalized and this is normally in children under a year old. This is because they are at a higher chance of developing conditions such as pneumonia, which is quite prevalent in children. Pneumonia occurs in 1 out of 5 children who have whooping cough and are less than a year old. 75% of whooping cough patients who are less than 6 months old end up being hospitalized and the illness can endanger their lives. When admitted in hospital, these children may require suctioning of their thick respiratory secretions and IV fluids also may be administered if the child has difficulty eating or has symptoms of dehydration. Breathing is monitored and if necessary, oxygen may be given. Special precautions are undertaken by hospital staff, patients and visitors to prevent infection. Follow instructions, humidify the room and keep the environment irritant free. When treating the child at home, you need to follow through with the prescription to the letter, especially when dealing with antibiotics. Let the child rest and you can use cool-mist vaporizer to soothe the breathing passages, irritated lungs and encourage a smooth respiratory secretions. Ensure that the vaporizer is disinfected and clean. Also keep your home free from irritants such as smoke. Eat smaller but more frequent meals. Children with whooping cough don’t drink or eat much due to the uncomfortable coughing. It’s recommended that you give your child smaller meals and increase the frequency to ensure that they feed well. Drink plenty of water. Also encourage your young one to drink enough fluids to prevent dehydration. Signs to look out for are lethargy, dehydration, irritability, restlessness, dry skin, fewer wet diaper changes or fewer short calls to the bathroom in older children and no tears when crying. Vaccination during pregnancy. The mother also may get Tdap vaccination when pregnant and it is recommended that you get this vaccination with each pregnancy. The vaccination is administered at 27 -36 weeks and helps the expectant mother to build immunity and antibodies that fight the pertussis virus from your newborn as well. Vaccination of the baby. There are two vaccines given to protect your child from whooping cough and these are: DTaP which is given to children under the age of 7 and Tdap for older kids and adults. These vaccines also provide protection from tetanus and diphtheria. You also need to follow the vaccination schedule for children and there are 5 doses given from the 2nd month to the 4th - 6th year. When the vaccine schedule is followed, it is effective by as much as 90%. Vaccination of others. All adults, caregivers and older children in the home need to be vaccinated as well.